Memorizing Bible verses and passages is one of those things that Christians tend to disagree upon. What I mean is that some say memorizing Bible verses is just another one of those “you must do” things to show you are a good Christian. Others believe that it is a good exercise to teach children, if for no other reason than, to help train their brain how to retain information. I believe that memorizing Bible verses is a great way to remove those things from your brain that have been put in there by the world and replace them with the Word of God, thereby helping believers to be transformed into the image of Christ. All of my memory verses (and passages) are from the KJV. 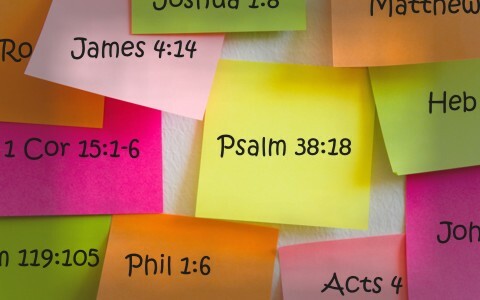 Here are just 25 great KJV Bible verses and passages that I encourage you to memorize. 1 Corinthians 15:1-6 Moreover, brethren, I declare unto you the gospel which I preached unto you, which also ye have received, and wherein ye stand; By which also ye are saved, if ye keep in memory what I preached unto you, unless ye have believed in vain. For I delivered unto you first of all that which I also received, how that Christ died for our sins according to the scriptures; And that he was buried, and that he rose again the third day according to the scriptures: And that he was seen of Cephas, then of the twelve: After that, he was seen of above five hundred brethren at once; of whom the greater part remain unto this present, but some are fallen asleep. Philippians 4:6-9 Be careful for nothing; but in every thing by prayer and supplication with thanksgiving let your requests be made known unto God. And the peace of God, which passeth all understanding, shall keep your hearts and minds through Christ Jesus. Finally, brethren, whatsoever things are true, whatsoever things are honest, whatsoever things are just, whatsoever things are pure, whatsoever things are lovely, whatsoever things are of good report; if there be any virtue, and if there be any praise, think on these things. Those things, which ye have both learned, and received, and heard, and seen in me, do: and the God of peace shall be with you. Psalm 38:18 For I will declare mine iniquity; I will be sorry for my sin. Psalm 91:10-11 There shall no evil befall thee, Neither shall any plague come nigh thy dwelling. For he shall give his angels charge over thee, To keep thee in all thy ways. Now, when you begin memorizing the passage start with the first line only. Once you have committed that to memory then add the next line. Recite the first and second lines and when you have committed that to memory add line three and then continue until you have memorized the entire passage. I pray that today you may take even just one of these KJV Bible memory verses and commit it to memory so that when you need it you may recall it to your mind. Great instruction Pamela! You have created a mini-Bible. It covers all of the essentials of our faith. Previous post: What Is A Daniel Fast? Next post: What Is A Bible Concordance? How Do You Use One?